Summer Program registration is handled online through our CampDoc online registration system. First time users of the system will need to create an account, using an email address and password. Once the account is created, families can continue to use this login for future use to register for camps, add parent and/or guardian information, or pay off camp balances. If any of the Overlake Summer Program sessions are full, families can request to add their child to the waitlist during registration. If space becomes available, we will contact families directly by phone and email. Families will have 48 hours to respond and let us know if they want to enroll their child into the session. If we do not hear from you during that timeframe, we will contact the family with the next child on the waitlist. For Middle School camps, students should be prepared to participate in either of the two preferences that they identify during the registration process. If there is significant interest in a particular camp within a session, preference will be given based on registration date. Camp assignments will be emailed to families two weeks before the camp start date. If parents have questions about camp assignments, please contact the Summer Program Director (nedmunds@overlake.org). Families can withdraw their child from a program at any time. Families that withdraw their children from a program before June 1st will be given a full refund minus the nonrefundable registration fee of ($50.00). Cancelations made after this date, but before the first day of a registered session, will be given a 50% refund minus the nonrefundable registration fee. No refunds will be given for cancelations after the first day of a registered summer session. To completely withdraw from a program, please contact Nathan Edmunds, Director of Summer Programs, at nedmunds@overlake.org. New in 2019: Overlake's campus will be under construction during the 2019 summer. Whereas in 2018, drop-off and pick-up took place in the lower parking lot, in 2019 drop-off and pick-up will take place in the upper parking lot. On the first day of camp, parents should park in the upper lot and come with their children to the registration table at the flag pole, which is directly in the center of campus. After the first day, families will drop their children off in the upper parking where they will then walk to the flag pole. Parents are not required to park and check-in their child after the first day, although they are welcome to do so if they wish. Pick-up takes place at the upper parking lot each afternoon. Counselors will walk the students to the parking lot and connect them with their rides there. For extended care: Pick up for extended care (4:15-6:00 pm) takes place in the 5th and 6th grade building (right next to the flag pole). Families are required to park in the upper parking lot and pick their child up from the 5th and 6th grade building. Families enrolled in extended care will receive a specific email that outlines this process more thoroughly. Note: Students who are signed up for both morning and afternoon sessions will stay for lunch and activities from 12:00-1:00. Parents do not need to pick up their child between the morning and afternoon sessions. Summer Program Staff will only release children to the adults listed on their registration form. If families carpool, please login to your CampDoc account and list all other adults (Grandparent, Nanny, Friend, etc.) or older siblings that are authorized to pick up your child in the Carpool Verification tab. You can email the Director of Summer Programs, Nathan Edmunds, to authorize a one-time same day pick up request. The parent or guardian of the student should notify the Summer Program Director (425-868-6191 x424 or nedmunds@overlake.org) that their child is arriving late that day. Once you arrive on campus, your child should go to the front office where a Summer Program counselor will bring them to their camp. Please alert a Summer Program Director (425-868-6191 x424 or nedmunds@overlake.org) that you plan to pick up your student early that day. A Summer Program staff member will ensure that your child meets you at the pick-up area at the appropriate time. The Overlake Summer Program will be offering Afternoon Extended Care from 4:00-6:00pm. Afternoon Extended Care is $60/week. Extended Care takes place in the 5th and 6th grade building and outdoor area surrounding it. Parents are required to come and pick-up their child from the 5th and 6th grade building. Families that pick up their children late from Afternoon Extended Care will be charged a $15 late fee per 15-minute window. All times will be rounded up to the quarter hour. Families that are chronically late may be asked to withdraw from our Summer Program before their session has ended. 12:00: Students who are staying for the afternoon go to the campus center for lunch; Students who are leaving walk to the upper parking lot for pick-up. Campers can bring their own lunch or purchase a hot lunch from the school cafeteria. If you would like to purchase lunch, you can do so when registering for the camp in CampDoc. Lunch costs $40/week ($8/day). Refrigeration and microwaves are available for campers who bring their own lunch. During community time, Overlake will provide a small snack for each student. All snacks will be nut-free, and a gluten free option will always be available. If you have specific concerns about snacks, please include them in your CampDoc profile. 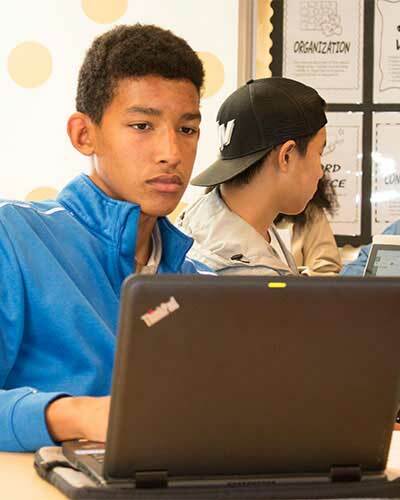 For safety and security, families need to contact the Summer Program Director, Nathan Edmunds at nedmunds@overlake.org or 425-868-6191 x424, if students will be absent. There are no refunds for days or weeks that students cannot attend summer session. Safety of students is Overlake’s highest priority. 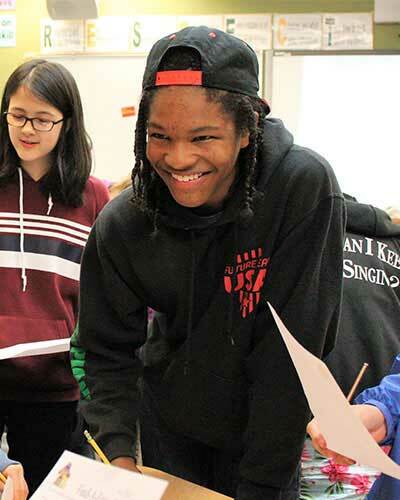 The Overlake School works very hard to create and maintain a safe involvement for all individuals that participate in any activities on campus. All Summer Program Faculty & Staff are First Aid/CPR certified. In consultation with the Athletic Trainer, Summer Program Faculty & Staff will treat minor injuries to students with their first aid knowledge. Summer Program Faculty & Staff will call 9-1-1 immediately if any student is significantly injured. They will follow that call with notification to parents and/or guardians of students involved. In the case of minor or major infractions, an Accident/Injury Report will be filed by staff & faculty involved in alleviating the incident. Families will be notified about any safety concerns by the Director of Summer Programs. At Overlake, we believe discipline is a community responsibility, all faculty and staff contribute to maintaining standards of student conduct. During our Summer Program, we will ask all Teachers and Summer Program Staff to make clear their academic and behavioral expectations at the start of each session. It will be the responsibility of these faculty and staff members to hold students accountable for the expectations they have assigned using the best practices of classroom management. Issues of classroom management, such as, but not limited to, minor infractions such as socializing in class and tardiness, may be handled by the teacher at their discretion. In such cases where the student has not responded to the teacher‘s corrective measures, they may refer the student to the Summer Program Director. In consultation with Summer Program Faculty & Staff and parents of students involved, the Director of Summer Programs will handle all major infractions taken by students at his or her discretion. Students who violate the behavioral expectations are subject to more serious consequences such as suspension. Further information on Disciplinary Policies & Procedures can be found in here.